Updated 3-14-2019. A preliminary listing of Domestic Recoveries is available online and we will be adding recoveries at the overwintering sites in Mexico soon. If you participated in the tagging program this season, please review the information on this page carefully as some of the submission details have changed for 2018. Also, check back for updates throughout the tagging season. Thank you! Ready to upload your data to Monarch Watch? Jump to SUBMITTING YOUR TAGGING DATA below. The Monarch Watch Tagging Program is a large-scale citizen science project that was initiated in 1992 to help understand the dynamics of the monarch's spectacular fall migration through mark and recapture. Tagging was originally used by Dr. Fred Urquhart of the University of Toronto help locate overwintering monarchs and later to determine where monarchs came from that wintered in Mexico. Our long-range tagging program at Monarch Watch continues to reveal much more. Tagging helps answer questions about the origins of monarchs that reach Mexico, the timing and pace of the migration, mortality during the migration, and changes in geographic distribution. It also shows that the probability of reaching Mexico is related to geographic location, size of the butterfly, and the date (particularly as this relates to the migration window for a given location). In order to be able to associate the geographic "mark" location with that of any subsequent recapture, each butterfly tagged must be uniquely coded. A new series of 3-letter, 3-number codes is generated for each tagging season and printed using permanent inks on all-weather tags with a pressure-sensitive adhesive backing. These lightweight, circular tags were designed by Monarch Watch specifically for tagging monarchs. When applied as directed, the tags do not interfere with flight or otherwise harm the butterflies. Each fall we distribute more than a quarter of a million tags to thousands of volunteers across North America who tag monarchs as they migrate through their area. These "citizen scientists" capture monarchs throughout the migration season, record the tag code, tag date, gender of the butterfly, and geographic location then tag and release them. At the end of the tagging season, these data are submitted to Monarch Watch and added to our database to be used in research. Monarch Watch Tagging Kits include a set of monarch butterfly tags, a datasheet, tagging instructions, and additional monarch/migration information. Kits come with tags in multiples of 25, ranging from a tagging kit with 25 tags to a tagging kit with 500 tags. Multiple kits may be ordered to obtain the desired number of tags over 500. For example, to receive 700 tags, order a 500-tag kit and a 200-tag kit. Tagging Kits may be ordered at any time and they are shipped beginning August 1st to arrive ahead of the migration. 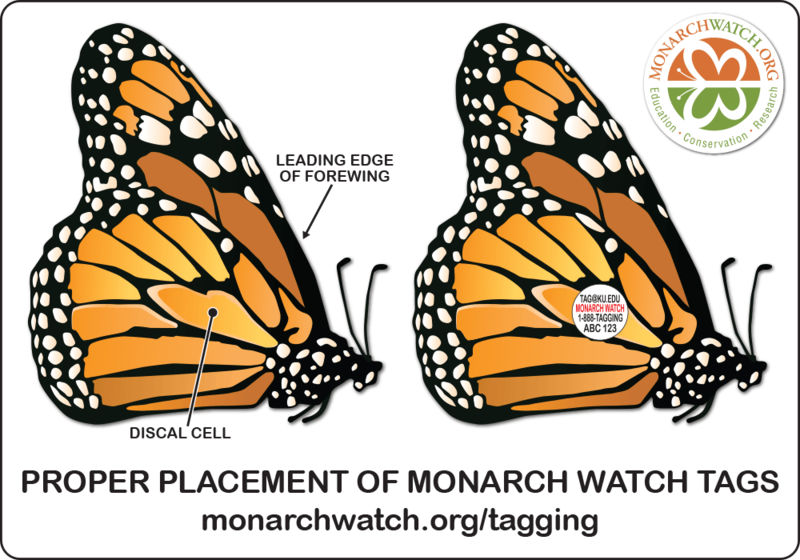 Tagging Kits are available from the Monarch Watch Shop at shop.monarchwatch.org or by phone at 1-800-780-9986. An order form may also be downloaded and faxed or mailed using the contact information on the form. Don't forget a butterfly net! Quality nets are also available from the Monarch Watch Shop. PLEASE NOTE: We only distribute monarch tags to areas of North America east of the Rocky Mountains. *A spreadsheet is the preferred format for submission of tagging data to Monarch Watch (via the form linked below) as this allows us to compile the data in a more efficient manner. The spreadsheet file may be opened, filled out and saved using Microsoft Excel, Google Sheets, Apple Numbers, WPS Office Spreadsheets, Apache OpenOffice Calc or another spreadsheet application. Upon receiving a tagging kit, please make note of the number of tags and the series of tag codes (for example, ABC500-999, XYZ300-349) in the space provided on the datasheet - we would like you to include this information when you submit your data. Please pay close attention to the data you are recording/entering to ensure its accuracy and double check your work prior to submitting. The complete 6-character tag code is critical; be sure to include all three letters and all three numbers for each tag record. Many taggers will find that the most convenient way to record tagging data is to use a paper datasheet in the field then enter that data into the spreadsheet template provided above. • Tagger name and other contact information must be included on each and every sheet. • Record tag codes in numerical order - this will make it much easier to enter the data. • Taggers must use the spreadsheet template provided above. DO NOT remove, combine, change the order of, or add any columns. However, existing columns may be resized to accommodate data. • Submit all data in a single spreadsheet file and enter data on a single worksheet. There is no need to create a new sheet for each set of 25 tags in an attempt to mimic the paper sheet. • DO NOT use ditto marks or other notations to indicate that the data for a given cell is the same as the cell above it. • Enter complete data (including contact info) for each tag code record. • Copy/paste may be used to fill in the data set where the information is identical. For example, in the sample spreadsheet below, everything from the tag city to the email address in row 2 could be copied and pasted into the cells of rows 3-12. • A spreadsheet application's "fill-down" function can be useful in completing a data set; however, be sure that no errors are accidentally introduced in the process. • If using a spreadsheet application other than Microsoft Excel, please save/export/download your file in Excel format (with the extension .xls or .xlsx). If this is not an option, comma-separated format (with the extension .csv) is acceptable. See "Submitting Your Tag Data" below for additional information. Carefully hold a monarch between your thumb and index finger along the leading edge of the butterfly's forewings (close to the body, not at the tip) and locate the discal cell (large mitten-shaped cell on the hindwings). The tag is placed over the large, mitten shaped cell (discal cell) on the underside of the hindwing of the monarch. This tagging method places the tag close to the center of lift and gravity for the butterfly so as to not interfere with flight or otherwise harm the butterfly. Please submit your data once you are finished tagging for the season and by December 1st if possible. Every year Monarch Watch spends time and money contacting people that did not return their data. The data for a recovery is useless if we are unable to verify when, where, and by whom the butterfly was tagged. To submit your data, you may still mail it to the address on the datasheet; however, please consider downloading a Monarch Watch Tagging Datasheet in spreadsheet format (available above) to submit via a simple online form instead. This allows us to compile the data in a more efficient manner. where you will be asked for your name, email address, the complete tag code series you received (for example, ABC500-999, XYZ300-349) the number of tags received/used and presented with a button to locate and upload the file from your computer. If you are unable to enter your data into a spreadsheet but would still like to upload your sheet as a PDF file or other image file, please name your file in the format: 2018-lastname-firstname along with the appropriate extension for the file type (.pdf for PDF files and .jpg or .png for other image files) and follow the rest of the instruction above. Please submit your data by one method only (preferably online). That is, if you submit your data online, please do not mail in your sheet(s) as well. 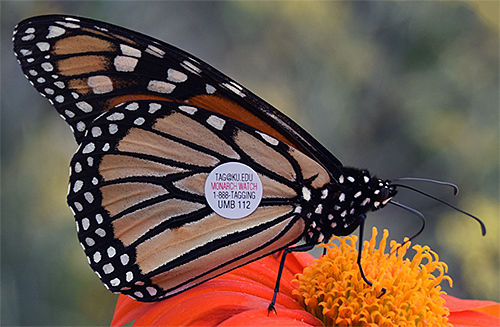 Tagged monarchs observed or recovered in the United States, Canada, and northern Mexico ("domestic recoveries") are often found by people who are not familiar with the Monarch Watch tagging program. 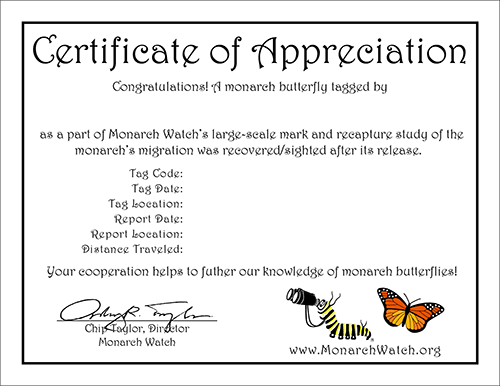 They are directed to submit the recovery information (complete tag code, date, location, and contact info) via the Monarch Watch Tag Recovery Form so that it may be added to our database. The majority of the recovered tags are obtained in Mexico. Early each year we visit the overwintering sites, particularly El Rosario and Sierra Chincua, where we purchase tags from the guides and ejido members. The ratio of untagged to tagged monarchs is quite high and it takes several hours on average to find each tag among the dead butterflies on the trails and under the monarch-covered trees. We pay approximately $5US for each tag, reasonable compensation for the time and energy spent locating them. Older tag data is not available at this time. Tagging should begin in early to mid August north of 45N latitude (e.g., Minneapolis), late August at other locations north of 35N (e.g., Oklahoma City, Fort Smith, Memphis, Charlotte) and in September and early October in areas south of 35N latitude. The following table provides a general guideline for when good numbers of monarchs should be observed at each latitude. These predictions are derived from reports to Monarch Watch, first-hand observations and the records of thousands of tagged butterflies that have been recovered over the years. The migration record at specific locations for any given year may differ from this overall pattern but it has proven to be remarkably consistent when viewed as a large-scale phenomenon. As such, it has a phenology and it's predictable. Notice that we have used midpoint as a predicted date rather than a mean. We don't have enough information on the flow of the migration to generate a mean. Further, the distribution of the migrants appears not to be a normal bell-shaped curve but a curve that is shifted strongly to the left. Hence, when estimating the time of peak abundance below we have used a 12-day interval with 7 days before the midpoint and 4 days after the midpoint. As mentioned above, this is a general pattern. It is likely to be modified by weather patterns that retard, such as strong southwesterly winds, or advance the migration, such as a series of rapidly moving cold fronts arriving from the northwest. Similarly, the pattern of the migration is likely to be modified along the coasts due to strong head winds or storms that have the effect of sweeping monarchs toward the coast on the backside of fronts. *This latitude represents the general vicinity of the overwintering colonies. The monarch colony at El Rosario is usually opened to the public around the 18th of November. Quality butterfly nets are available from the Monarch Watch Shop (item# 120003; shop.monarchwatch.org or 1-800-780-9986). The opening of any net should be 12" or more in diameter and the net bag should be at least 24" deep to allow trapping the butterflies in the end of the net without harming them. Net bags can be made from a variety of materials but it is advisable to choose see-through materials that won't rip easily as the net is swept over vegetation. The mesh should also be small enough that the monarchs aren't able to wiggle free. When in flight, monarchs are difficult to catch. It's best to locate monarchs feeding on flowers or in roosts late in the day or early in the morning to maximize your effort. With a butterfly net in hand, approach slowly (from behind if possible), as sudden movement will startle butterflies into flight. Sweep the net forward quickly and flip the end of the net bag over the handle to capture the butterfly deep in the net bag. Collapse the end of the net bag so the wings of the butterfly are closed over its back. Place thumb and forefinger over the leading edge of the wings (from outside of the net) and then reach into the net to firmly grasp the thorax and remove the butterfly for tagging. If more monarchs are collected than can be tagged immediately, they can be stored in a paper triangle or glassine envelope (stamp envelope). To store for more than a few hours, i.e. overnight or up to 2 days, place the envelope in a plastic box or zip lock bag in a refrigerator. The cool temperature will slow their activity. Be sure to keep the butterflies out of the sun before refrigerating them. To keep the butterflies from drying out and dying, place a damp paper towel in the container. 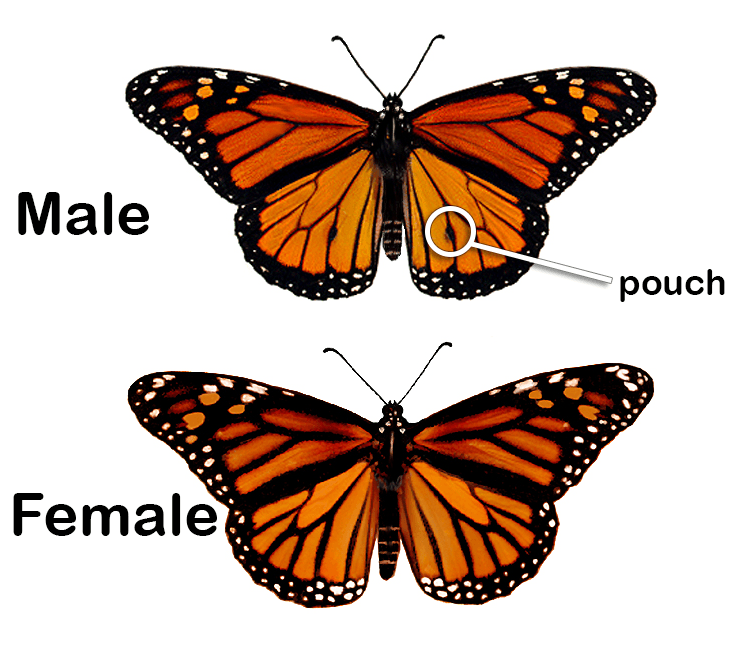 Once you become familiar with monarch adults, determining the gender is relatively easy. Males have an enlarged pouch midway along a vein that is directly below the discal cell on the hindwing (see below). In species closely related to the monarch, this is a source of pheromones used in courtship. The pouches do not appear to be functional in the monarch. Females lack these pouches and appear to have thicker veins than males - this is actually only a difference in pigmentation. Upon close examination, males and females also differ significantly in the anatomy at the tip of their abdomen. On our tagging datasheet we ask whether the tagged monarch was Reared or Wild. For taggging data purposes, adult monarchs reared from the egg, larva, or pupa stage should be considered REARED (R) and monarchs captured as adult butterflies should be reported as WILD (W).